My parents have a fairly large garden and they are really good at growing potatoes. Tons and tons of potatoes. Big potatoes and tiny baby potatoes. Last time I went home my parents gave me a sack of various sized potatoes. 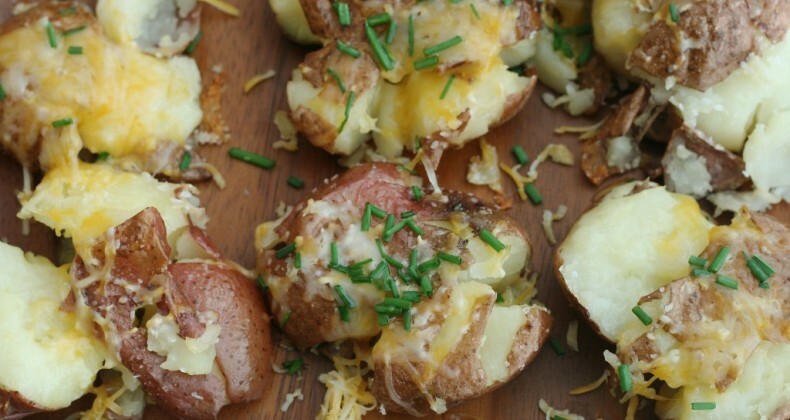 This recipe used up all the tiny baby potatoes. Leave off the dairy to keep it Whole30 friendly! Wash then boil the potatoes in salted water until a fork easily pokes into them about 15 minutes. Remove from cookie sheet to serving platter. Sprinkle with cheese, chives, and bacon. Garnish with sour cream if desired. Simple, delicious, awesome. Love it. 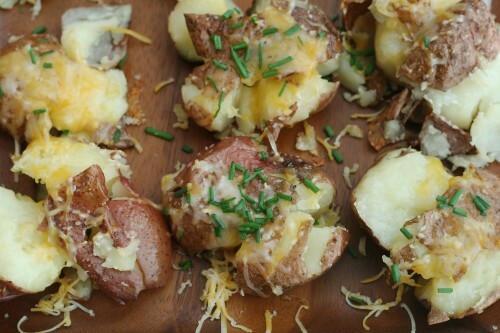 I have been meaning to make some smashed potatoes, so thanks for posting this great recipe! what a terrific side dish!